If films blatantly aimed at a Christian audience are your thing, then you're absolutely going to love this cheesy, melodramatic trailer for Little Boy. The film takes the phrase that "faith can move mountains" literally as a young boy believes he has some kind of mind powers to make things happen, like moving a mountain. What's interesting is that this film actually has a decent cast with Emily Watson, Tom Wilkinson, Michael Rapaport and Kevin James for some reason. They all surround Jakob Salvati as the title boy who just wants to bring his father home from World War II. This movie looks tailor made for people who see only the most tame family films in theaters, and that's just not my cup of tea at all. Watch? Little Boy is directed by Alejandro Monteverde (Bella), who co-wrote the script with first-time feature writer Pepe Portillo. 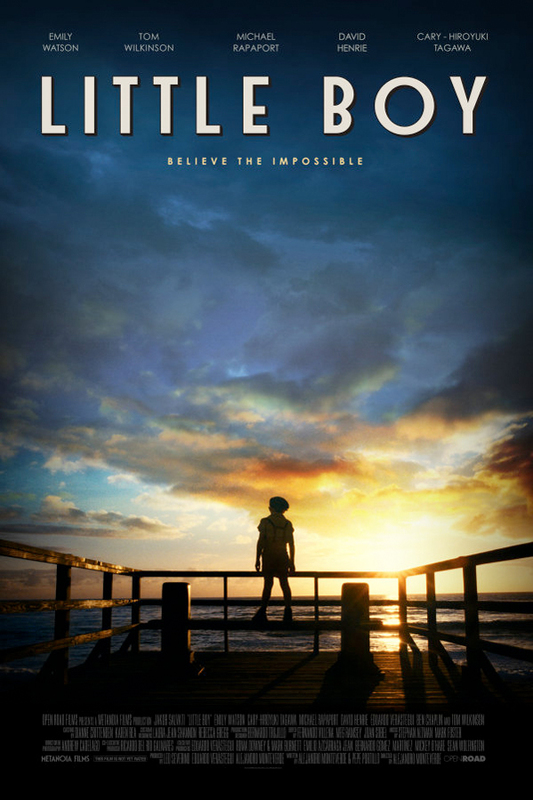 Set in the 40s, the film follows a 7-year old boy (Jakob Salvati) who is willing to do whatever it takes to end World War II so he can bring his father (Michael Rapaport of The Heat) back home, showing the incredible love a father has for his little boy and the love a son has for his father. Emily Watson, Tom Wilkinson and Kevin James also star in the film which Open Road Films releases on February 27th, 2015. Its a different type of movie but I'll see it. I think we have a contender for the worst decision in Michael Rappaport's career, the last season of Prison Break is now a close second. Thankfully there are various cups of tea for all types, some families just like safe and that's alright. It definitely has a target audience that shouldn't be made a target due to probably most of the commenters don't like being shoehorned into a certain faith or belief. I am a Christiian who loves horror, Key and Peele and 21 Jump Street which would cause some church goers to raise an eyebrow, but everyone chooses which sin they like to hate. I just don't like these movies because of how obviously they pander to an audience known to buy out theaters just because the film has positive religious themes. More power to you for being an open-minded person of faith though! Which of course, makes me better than no one! But I hear ya Ethan, churches will buy out theaters just because of the word Christ and nothing else. I have more often been inspired spiritually through secular films than religious. Interesting concept. But I will never see this film. Cleanse that child with FIRE! He is clearly a witch. Looked pretty good until the god element came in...."takes courage to believe"...actually I believe it takes more courage to not believe. These movies come across is little more than religious versions of propaganda films... their sole purpose is to preach and not worry too much about facts.